The crappy economy makes it hard to feel like even an occasional splurge is ok. But my wise friend Jeannie rightly pointed out that living in fear is not really living. So from time to time I remind myself of that and try to work a special treat into the kitchen or pantry. Maybe it’s a bottle of finishing oil to give dishes a lovely punctuation, a bar of extra dark chocolate to savor, or a small order of sushi for The Mistah to enjoy. Most recently it was a container of white truffle butter and fancy pasta. Most times I won’t go out of my way when a recipe calls for a specific brand of something. If I see that brand and it’s comparable to the price of what I’d normally buy, I might give it a try. Or I might not. I’m a lousy, unpredictable consumer like that. 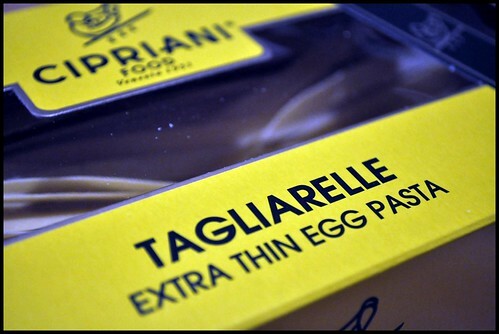 But for some reason I decided to buy the exact brand of fancy pasta that Ina called for in one of her recipes even though it meant going to three different grocery stores and spending a small fortune for something that essentially breaks down into eggs and flour. And as much as it pains the recessionista within me to say this, it was worth every penny. Never, and I mean absolutely never, before have I had a more exquisite pasta. In only three minutes of cooking, those noodles were absolute perfection. Tender and loose with just enough al dente, the tagliarelle was soft and firm at the same time. I realize that probably makes no sense whatsoever. But it’s the only way I can describe it. They must work a little magic into the dough to make it so special. Pair this with a creamy sauce, like Ina’s Truffle Butter, or simply top with some butter and shaved Parmesan for the most delicious splurge. This is definitely not an everyday dish. But every so often I think my inner recessionista needs a tasty reminder not to live in fear. BAH Note: As much as I believe in using what you have, this one time I’m going to say don’t substitute ordinary grocery store pasta for the Cipriani Tagliarelle. If you can’t find it at your local market, ask my friend Google and he’ll give you a number of resources. I got my pasta, as well as the truffle butter, from The Fresh Market. Ina relies on Dartagnan for her truffle butter. Both have online shops for your convenience. The truffle butter has a strong, earthy flavor. If that’s not your thing, skip the sauce entirely and go with shaved Parmesan and a drizzle of olive oil or some butter. Season a large pot of water with 1 teaspoon kosher salt and bring to a boil. Meanwhile, heat the cream in a large pan set over medium heat until it comes to a simmer. Add the truffle butter, lower the heat to the lowest setting, and stir until the butter melts. Taste for seasoning and add salt and pepper as desired. Keep the sauce warm over very low heat stirring occasionally. Add the pasta to the boiling water and cook for 3 minutes, exactly. If you’re using something other than Cipriani pasta, follow the directions on your package. Reserve 1/2 cup of the cooking water then drain the pasta. Add the pasta to the pan with the sauce and toss to combine. Add as much of the reserved cooking water as necessary to keep the pasta very creamy. Serve hot with a garnish of shaved Parmesan and a sprinkling of chives. Oh, I bet that was good! Heaven in a bowl! TKW, if this ever comes up at Barefoot Bloggers, do whatever you have to do to get the pasta and truffle butter. It’s decadent but ridiculously easy. And I bet if you threw some crumbled bacon into that sauce, angels would appear. I am a firm believer in Food Toy splurges!! Kristin, this pasta brings me as much happiness as a new purse. And I’m a purse addict, just ask The Mistah. Beth, I wish there was a way that you could make peace with pasta just to try this recipe. But we all have stuff that we can’t eat…my list includes nuts and anything with small seeds. How sad is that? I don’t even know what truffle butter is (I’m hopeless! ), but I want to try to make this! YUM! Amy, truffle butter has a bold, earthy personality. Melted in the heavy cream, it gets mellow and dreamy. This is quickly becoming my favorite dish. Ihave diverticulosis and am not supposed to eat seeds and/or nuts either. Some days though I just bite the bullet and roll the dice. I may get sick but I NEVER regret good food! Emily, you’re a bigger gambler than I am. After I almost landed in the hospital because of the same condition I became hypervigilant. I miss strawberries, corn on the cob, sesame seeds, kiwi, and cashews but not enough to go through that experience again. I refuse to miss anything. Give me strawberries or give me death!